It’s no secret at this point, both of us have lost a bunch of weight, these physical changes have been the tip of the iceberg. I have questioned myself at a fundamental level when it comes to who I am and what I’m about as a result. It has not always been easy to stay on track and to make the sacrifices of discomfort and hunger. I was often tired. I was sometimes emotionally overwhelmed, but pushed through because nothing gentle had yielded results in the past and my long term health was at risk. I had no idea as the pounds came off, my intellectual appetite would change as well. I cannot speak for Chris’ experience of this except for what he shared with me. He expressed some concern about loosing some of the geek identity that is so much a part of our lives, both individually and as a couple. We had a Klingon wedding – twice – for crying out loud. Our walls are covered with geeky artwork and autographs from sci-fi and cartoon greats. We have geek cred like crazy. By the time Chris had mentioned the issue, I had already thought about how difficult it was for me to get interested in watching television and pondered the implications. For both Chris and I, keeping up with or watching new shows or even old favorites became less important. I didn’t care what was going on in the DC television universe or that it’s no longer possible to watch weekly on Hulu as we have in previous seasons, figuring I’ll eventually see it on my own schedule. We have even stopped watching the wonderfully done Victoria on a weekly basis on PBS. We saw the important geek movies released during the time period. Doctor Strange (twice), Fantastical Beasts & Where to Find Them, Rouge One, Lego Batman. Enjoyable entertainment, for sure, but not the intense experiences I’ve had with other films in the last few years with Deadpool being the most extreme example of anticipating a film being a major part of my life. I will always look back fondly at what reading Deadpool comics prior to the release date and the film’s brilliant marketing for giving me something both fun and irreverent to look forward to over the winter of 2016/2017 when I needed that exact thing. As thrilled as I was to get the Batman movie we deserve this winter, the experience wasn’t the same and likely never will be. Deadpool was the perfect anti-hero to show up at an imperfect time. It’s not as if I’ve turned my back on my love for spaceships, dragons, and heroes in capes. I’m still inspired by the stories and I still think in pop culture references. In times of crisis, I’m going to read A Wrinkle in Time or watch Indiana Jones movies because they remind me of who I am and what I believe. Fiction, especially fantasy and it’s modern descendant science fiction, made me who I am. But at least for now, I don’t need my precious fictional universes front and center to mask what I was missing from real life action – primarily me driving the narrative. Those worlds are my heart’s home but I don’t have to spend all my free time there. With my attention split between figuring out what to eat within the strict guidelines of our diet and strengthening myself mentally with mindful meditation and earnest study of stoic philosophy to help me bear the stain I was putting myself under, I didn’t have room for much else. With the extra time gained by not spending nights and weekends binge watching old shows and movies for hours upon hours, together or separately, Chris and I listened to audiobooks and podcasts, the vast majority of them in the realm of self-improvement, efficiency, and other similar topics. (Special shout out to Tim Ferriss for being our Oparh.) I read more non-fiction than fiction, including thousands of recipes which either fit our limits or could be modified. I worked in a few memoirs, notably Carrie Fisher’s Wishful Drinking and Debbie Reynold’s Unsinkable. Real life examples resonated with me, especially those ladies who accomplished much in the face of so many challenges. What I began leaning on primarily for mental and emotional support was both mindful meditation and stoic philosophy. I discovered meditation originally in early 2014, learning from the book Mindfulness: An Eight-Week Plan for Finding Peace in a Frantic World. Sometime later that same year, I heard about stoic philosophy on an episode of Dr. Drew’s podcast with author Ryan Holiday. I listened to the episode twice back-to-back and read Ryan’s book The Obstacle is the Way immediately. I so identified with stoic ideals. I love, too, that it is a philosophy and not a religion. It is important to me to live in a way which is no less ethical regardless religious or supernatural truth as I may see it as all mankind should live to the same moral standards. Prior to the great potato fast of September 2016, I had signed up for the Headspace meditation app in order to renew a daily practice. I was a couple months into the program before the dietary changes – currently 294 days consecutively. As we started the fast, I began reading back through The Obstacle is the Way. As fate would provide, I discovered through a Facebook friend, Stoic Week put on by Modern Stoicism which happened to fall in mid-October. Both the Stoic Week activities and the active Facebook group have been a delightful learning experience. I have studied more about the individual philosophers as well as the practical applications of philosophy. Marcus Aurelius became an early favorite, in part because he wrote reminders to himself on how to behave rather than to teach others. I can imagine this powerful and wise Roman Emperor who was ahead of his time morally if not perfect by modern standards struggling with himself as I struggle each time a passage resonates with me. It is impossible to say for sure, but I cannot imagine having endured a two week mono-diet of plain potatoes and the following months of saying no to everything about American food culture in favor of whole plants without both mindfulness and philosophy to lessen the misery factor. I know it was a good choice for my long term health, but it was hard. I had to decide as in the last couple months as the reality of my physical transformation kicked in – around 170 pounds at this writing and 25 pounds from my rather arbitrary scale goal – what else I am. Once I am “done” and have established what food and workouts will be to meet the next challenge of two years maintaining the loss, I will have freed up some of the mental and physical bandwidth I’ve been using on changing my body. I also have a wealth of newfound confidence. To paraphrase one of my long time virtual mentors Adam Carolla, you learn to do things by doing things, sometimes even if they aren’t exactly the same things. I do want to write more. I don’t know exactly what that will mean and I’m okay with that. My writing has always been wiser than I am. If I sit down to the keyboard on a regular basis, I’ll figure it out. I proved to myself blogging is something I care about when in January I broke my WordPress installation. I am still in the process of restoring the posts, a few at a time as it is tedious work, but I was not apathetic as my poor posting track record would indicate. I have plans to post about food, because who doesn’t love food? I have so many ideas about how to eat wholesome food without breaking the budget or spending all day in the kitchen. I always plan on more old fashion analog arts and crafts especially sewing with posts about my projects. I would like to write thoughtful pieces about the books I read, less review and more discussions like I enjoy reading. I don’t know what else, but as long as it’s something, I’m okay with that. 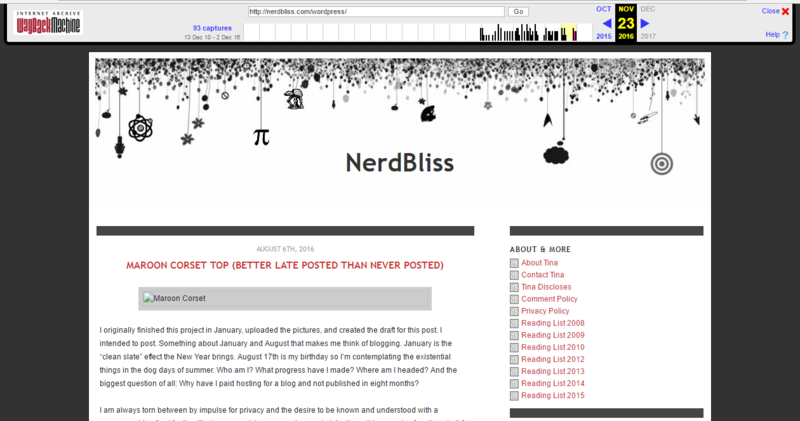 Part of the reason I dreamed up the name “Nerdbliss” is how flexible it is as a brand. No matter what I do, I do it nerdy because I am passionate, curious, and exuberant. I don’t know how to do things halfway. I love adding to my bank of both experiences and knowledge. At the time, it was more what I hoped my life would be about and now I’m much closer to the ideal. One of the things that is happening with me and Nerdbliss is a growth into a podcast. Chris wanted to start one and asked if I’d be okay with him using the name. It took me some thinking to decide as long as it was a separate entity from my blog, I was more than okay with it. I have even been roped into participating as on air talent as well as applying my humble WordPress experience. Our first episode is up with a couple more in the can. Feel free to check it out at NerdblissPod.com. We want to cover a broad range of topics both traditionally geeky and passions outside of stereotypical geek culture. I hope, like this blog, not for wild popularity but that it will find it’s audience however small. So yes, I’m still a geek. I’m growing and incorporating the best ideas I find into who I am. If that isn’t the whole purpose of nerd-life, I don’t know what is. It’s a toss up on wither I’m going to talk your ears off about Seneca or Spock, but rest assured, it’s all the same to me.